The Seventh Seal belongs to a small group of films that so honestly depicts what life must have been like in The Middle Ages. I’ve read arguments suggesting that the costumes are not authentic, but such details cannot dismantle the atmosphere created by a lack of ornamental detail. The Seventh Seal strips down all facets of artifice to create a very palpable existence. It is set during the Black Death; Knight Antonius Block and his squire Jons have returned from 10 years of violence in the Crusades only to be met with more violence at home. Death comes to claim Antonius on the beach, one of cinema’s most recognized images. Antonius challenges Death to a game of chess, and during their game which takes place in segments, the Knight gets to live—for reasons that are his own; Death is not privy to them. Jof and Mia and their toddler son are actors from a small troupe lead by the rascal Raval. Raval escapes the torturous life of an actor by running away with the blacksmith’s wife. Jof and Mia remain innocent and naïve during this cruel time; as they perform for an unappreciative audience, the dispassion turns to humiliation as Jof is heckled. A band of flagellants disrupts their performance in one of the film’s most chilling scenes. Men and women who believe the end is near parade themselves, some carrying crosses, others abusing themselves to appease God. These are the equivalents to modern day people on the streets with posters warning the end is near, except the modern thinkers are too weak for pain and rely only on spectacle. The Seventh Seal was the first Ingmar Bergman film I had seen, and it was one of my first foreign language films. It embarrasses me to admit but the film put me to sleep. To be fair I had only 4 hours sleep and had to sit through a CPR class at 8am, and began the film around 9 at night. I wasn’t accustomed to the pace of a Bergman film, which is different even from other foreign films. For reasons I’m still not sure of, I pursued other Bergman works, and discovered the austere brilliance of the director’s work with Sven Nykvist, films made in the 1960s and 70s. I closed myself off from the director’s early work until about 2 years later when I decided to watch every one of Bergman’s films in chronological order. I was delighted to discover that many of this early films are brilliant, some masterpieces. Dreams is a particular favorite, looking ahead to films like Cries and Whispers, at least in its construction. 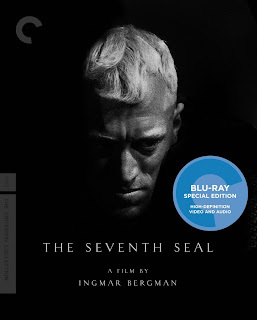 It was during my second viewing via Criterion’s perfectly restored Blu-ray that I first appreciated The Seventh Seal. Perhaps the film made more sense in context to the director’s output thus far, but I think I was mature enough as a film buff to discover the great pleasures the film offers. One is humor. There is never a moment when the film is laugh-out-loud funny, but Squire Jons has many great lines. At the beginning when he and the Knight meet a man sitting by the side of the road; Jons asks for directions only to discover the man a corpse. The Knight asks what the man said, and Jof replies, “He was quite eloquent.” In many ways the film reminds me of Shakespeare. Bergman was a playwright first and undoubtedly read more of Shakespeare than I care to. In particular the film, in its parts humor, horror and whimsy, recalls “A Midsummer Night’s Dream.” Gunnar Björnstrand is one of Bergman’s great actors. He’s the only substantial male lead who was physically handsome. Björnstrand excelled in comedy, evidenced in a film like A Lesson in Love. He showed off his awesome dramatic talents for Bergman many times as well, and his Jons is an observant man, the character here most closely related to Bergman I think, the doubter, the scorner of those with false faith, ridiculing the cruelties of man while accepting that, at least for him, God does not exist. A vital function of the humor (and Jons doesn’t carry it all—the blacksmith and Raval’s duel which takes an unexpected role reversal, and in particular Raval’s dues) is that it punctuates the horror. The scene of the flagellants or the burning of the witch is horrible to witness. It’s almost indescribable how potent Bergman assembled his film. One of the great strengths of the film is it’s openness to interpretation. Bergman often claimed during his younger years a lack of faith in God. In his later years, particularly in an interview when promoting Saraband in 2003, he believed that when he died he would be united with his beloved wife Ingrid. It might be the fear of nothingness that made Bergman cling to religious beliefs, and it is this fear that drives the religious characters in The Seventh Seal. The Knight stalls Death because he must understand God in tangible terms. The only figures willing to engage in such conversation are the folks tormenting a young girl, proclaiming her a witch and the cause of the plague. But they are near sighted. The girl has been beaten to submission, and believes that she is in communion with the devil. Antonius asks her about him because he is a connection to God, but staring into the girl’s eyes only reveals her fear of the stake. The men who torture her are typical zealots, men who have faith in their own Earthly power and not in the God they profess to believe in. Death is the obvious connection, on a metaphysical level, to God that the Knight can engage. But Death remains elusive all through their encounters. He reveals one important piece of information that seems contradictory to expectation but one that suggests there is no God: Death does not know; he has no answers. This seems to settle things for Antonius, or at least it allows him some peace. For someone with no religious convictions like myself, the film can be read as a life unfilled by a true God; only mortals spread disease and violence, but also beauty. Death is not an evil or a mystical force. The character is a personification of the plague; Death is a character in Bergman’s play. He has no answers because he has no connection to God. Death is a function of life. It is not evil. It merely removes those whose life has ended. For those religiously inclined the film will mean something different. It is about the mysteries of faith. The bible tells us we on Earth cannot fathom God’s wisdom. If the film is religious then it plays its viewpoints fair. A glaring fault of religious epics is its insistence in God and Jesus Christ. The Seventh Seal is only a document. Great arguments can be made on both sides (probably greater arguments for God’s existence can be made by others) and yet The Seventh Seal is not an intellectual exercise as Bosley Crowther argued in 1958. It asks questions and provides only facets of answers through the sheer force of its images. To claim the film is intellectual ignores the passion and humanity that is always a part of Bergman’s work. That he asks BIG questions is merely the director communicating with anyone in order to make sense of life as it has been taught to him. The Seventh Seal is essential viewing for film people. Any book on cinema history will quote its images. Two shots from the film’s opening scene have been reproduced hundreds of times. The Dance with Death is another one. Ingmar Bergman is one of the medium’s great directors, and this film has been the introduction of many to his unique voice. The film is humorous and unpleasant, fascinating to watch and a great historical document as a piece of film and of its subject matter.